If you’ve ever seen photos of Lance Mindheim’s layout you’ll be surprised to know that a great deal of the buildings are made from photos printed on paper. The realism that can be achieved is just as good and if not better than any plastic building on the market. 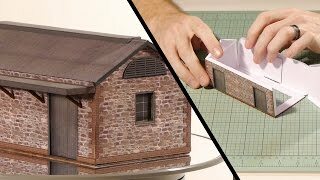 Aussie Card Models (ACM) are a relatively new company who are selling paper card buildings on the Australian prototype, and from what I’ve seen so far they are certainly taking the quality and expectation for card kits to the next level. Whether you are building an ACM kit or another paper kit from a different company the basic tips and techniques for construction that I display in this video can be applied. Paper kits when treated the right way will add realism and life to you model railroad or scenery diorama and if you’ve been unsure about trying to make a kit then I urge you to give it a try. They are much easier to make than any card kit and the end results are more consistent. If you’ve been enjoying the videos don’t forget you can help support me and these videos by donating to me through ‘Patreon’ every little bit helps and I’m truly appreciative of every donation no matter how big or small.